Brilliant for nourishing your skin both day and night, JASON Ester-C Lotion is a potent moisturising and antioxidant treatment for younger looking skin. Vitamin C works specially to fight free radicals and combat the signs of ageing. 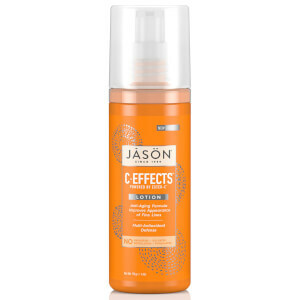 With daily use, JASON Ester-C Lotion helps skin withstand environmental stress and damage. This composite promotes the natural creation of collagen which helps to smooth away wrinkles and maintain a youthful complexion. Leaving skin with a smooth, refined feeling, this light lotion keeps your skin looking and feeling fantastic. After cleansing and toning, apply to face and neck using even, upward strokes.